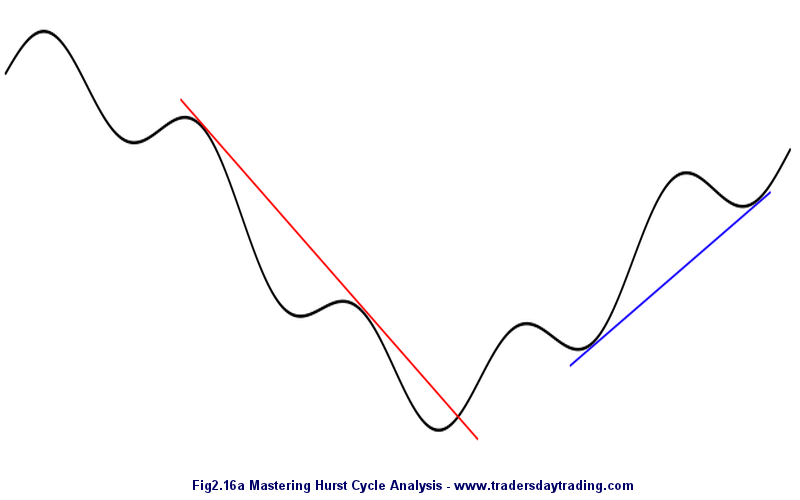 Part 2 of an Introduction to J.M Hurst Cycles Analysis and Trading Methods. Article submitted by Christopher Grafton, Author of "Mastering Hurst Cycle Analysis". In Fig 3.7 below, we can see how cycles start at a low point, the cycle trough 'A', and then advance to a high point, the cycle peak 'C'. This is the cycle upswing. From the peak, the cycle then falls through its downswing to a second adjacent trough to 'E'. For argument’s sake, let’s suppose that the cycle falls back to the same level as it started from. The time between the two cycle troughs is the period, or the length of the cycle and the height from trough to peak is the amplitude. The longer the period, the more power the cycle has and the larger the amplitude. It makes sense that an 18 month cycle will move prices further up and down than a 20 week cycle. Analysts like to draw trend lines on charts as they give a sense of order and sometimes generate trading signals. Quite often, however, trend lines are subjective and tell us little about the underlying market. 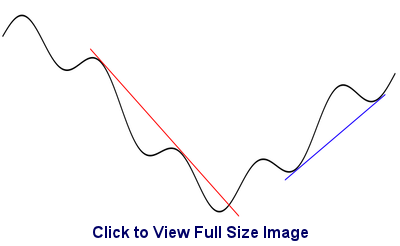 What we perceive as price action is simply a composite of cycles of different magnitudes. Each cycle from the shortest to the longest contributes to the composite and the net effect is trend. Thus, if the longest of the Hurst's cycles are all advancing together then the longer term trend is up and shorter Hurst cycles will experience successively higher troughs. Imagine Fig 2.16A shows a twenty week cycle with a flat underlying trend. If a straight line connecting adjacent cycle lows is projected into the future a horizontal line is plotted. Think of this as a trend support line. Now imagine that the twenty week cycle swinging back and forth around a longer cycle which is heading up. The line connecting the troughs now points up and starts to look more like a trend line. Because it is based on a rule (connecting adjacent troughs of the same cycle) it is objective. However think about what happens as the longer cycle tops and begins to turn down, it forces the twenty week cycle through the turn as well and the line connecting the troughs (the valid trend line) is crossed from above by the twenty week cycle. When the valid trend Line (VTL) is cut we therefore know that the next longer Hurst cycle has reversed. By making the trend line objective and by redefining trend in terms of cycles, Hurst’s valid trend lines (VTL) gives us a clear insight into price structure and tells us the magnitude of recent reversals. The second of JM Hurst cycles trading tools is conceptually a little more challenging. Imagine a perfect cycle with, let’s say, a period of 14 days and amplitude of USD20. It takes seven days for the cycle to peak and another seven days for it to trough again. Now imagine a duplicate cycle that starts up seven days later, such that when the first cycle peaks the second troughs and when the first cycle troughs the second peaks. The cycles are therefore out of phase, or put more accurately, they are in anti-phase. When the lead cycle crosses the lagging cycle from above we know two things: that the first cycle has peaked; that the peak must be a half cycle back; that its next trough will occur in one half cycle period’s time and that it will cover the same vertical distance to the next trough (USD7). Displacing cycles in this way is the essence of the somewhat cumbrously named Forward Line of Demarcation (FLD). Thus, if we plot a replica 20 week market 10 weeks forward in time, when prices crosses it we know that a 20 week cycle trough or peak must have passed within the last 10 weeks and we know roughly how far prices have to travel to the next 20 week peak or trough. If projections are overshot, then we know that a longer cycle is trending in the same direction (pro-cyclical) as the one under observation. If on the other hand projections are undershot, then we know that a longer cycle is trending in the opposite direction (counter cyclical) as the one under observation. Although there is a bit more to it than that, that is the basic idea. We use FLDs to project future prices, tell us the strength of underlying trend and ascertain the magnitude of recent reversals.